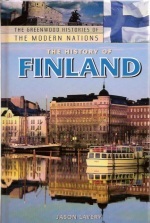 by Historian Jason Lavery, Ph.D.
- helps readers to understand the particular facts of Finland's history within global developments. - elaborates on Finland's relationships to Sweden and Russia. - investigates the impact of the cellular phone on Finnish society and across the world. - provides a review of the archaeological data from Finland's first settlement shortly after the Ice Age through the Iron Age. - examines the rise of Helsinki, the establishment of the Finnish language, the Finnish sauna, among other issues. - includes a timeline of historical events, maps, and a bibliographical essay for further reading. - describes 45 of the 100 Finns voted by the public as the most notable Finns in Finnish history. The inspiration for these projects came as a result of my most recent book, entitled The History of Finland. In researching for the book I was struck at how little attention historians have given to the role of religion in Finland's overall historical development. In this project I intend to make a case for putting religion more prominently in the overall narrative of the history of Finland and the Swedish kingdom to which Finland belonged until 1809. The sixteenth-century reform of the church in the Swedish kingdom, to which Finland belonged until 1809, followed two tracks of development. The first one was statebuilding, or more concretely for the church, the Crown's takeover of the church's wealth and administrative autonomy. The second track consisted of the changes in the Church's teachings and practices largely inspired by Lutheran reform. The extant scholarship has tended to study the two tracks in isolation from one another. The scholarship has presented statebuilding as a top-down process in which the Crown took wealth and power from the church. More recent developments in the larger scholarship of statebuilding in early modern Europe have uncovered statebuilding as an interactive process between the Crown and other, usually more local, social groups. Scholarship on statebuilding in the Swedish kingdom has focused on the agency of the peasantry and the nobility while ignoring possible agency by the church and clergy, despite the importance of the royal takeover of the church to the overall statebuilding process. This book will examine the interconnections between statebuilding and reform in the Swedish kingdom by examining events in the Diocese of Turku, a territory also known then and now as Finland, which encompassed the Swedish kingdom east of the Gulf of Bothnia. It will uncover the agency of the clergy in the statebuilding process. It will also examine the impact of Finland's geographical position on statebuilding and reform. This book will argue that the reform of the church occurred through the growth of both statebuilding and Lutheranism, and that those factors were interconnected as well as mutually reinforcing. This book will be the first monograph in any language on the Lutheran Reformation in Finland. This study's focus will serve as a mode for additional regional studies in respect to the Swedish kingdom and Scandinavia. Local and regional Reformation studies, while plentiful in respect other European countries, are lacking in respect to Scandinavia. Regional and local studies have proved useful in understanding the diversity of social, political, economic, and cultural aspects of religious reform. This study will refute the assumption, particularly in English-language scholarship, that the Swedish kingdocm, to which Finland belonged unti 1809, went irrevocably over the Lutheranisms during Gustav Vasa's reign. The book has a projected publication date of 2017. In the meantime, this project has already produced several articles. Their bibliographical information is available on my resume. Jason Lavery is a professor of history. Since 1997, he has been a member of the Department of History at Oklahoma State University. .
Jason Lavery received his B.A. (with high honors) in 1988 from the University of California, Berkeley, an M.A. and and M.Phil in 1994 from Yale University, and a Ph.D. in 1997 from Yale University. All degrees were in the field of history. His doctoral dissertation entitled The Holy Roman Empire and the Danish-Swedish Rivalry 1563-1576 was published in 2002 under the title Germany's Northern Challenge: The Holy Roman Empire and the Scandinavian Struggle for the Baltic, 1563-1576 by Brill. The navigation link Other Publications leads to more information. Jason Lavery has served as president of the Society for the Advancement of Scandinavian Study (SASS) and the Society of Historians of Scandinavia. Jason Lavery has served as a peer reviewer for Academy of Finland and for professional journals such as the Sixteenth Century Journal and Scandinavian Studies.